These are algebra bingo cards. You can use them to exercise and review algebraic terms like "plane" and "slope". You can also make it more difficult by calling out the definition of a term or an example of it. So instead of calling out "field" you would call for example "R and C are it but N and Z are not" you can then follow up with more questions like: "is Q a field?" 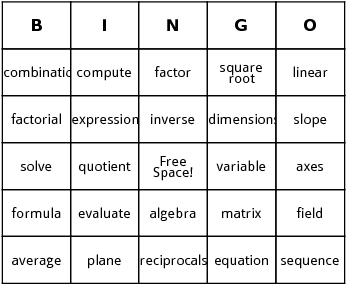 Add more algebraic terms to the algebra bingo word list to make the game last longer.